SUMMARY: Melnick-Needles Syndrome is a rare disorder associated with many abnormalities. This case report describes a patient with Melnick-Needles Syndrome who was found to have bilateral hypoplasia of the cochlea, a finding not previously described in the literature. 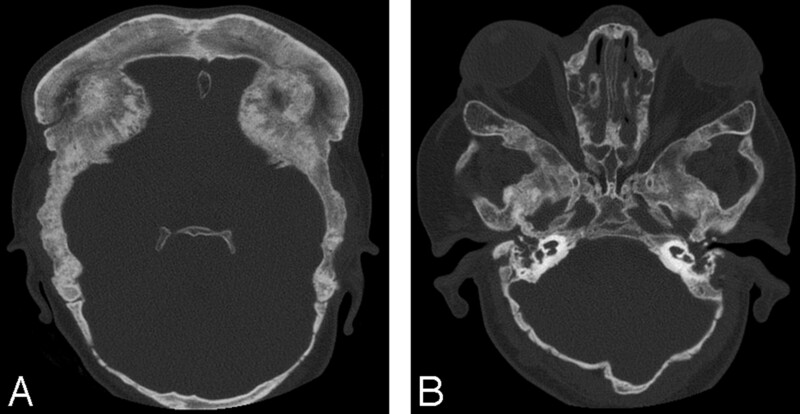 The case report describes the syndrome and demonstrates the findings on CT and MR imaging of temporal bones. Melnick-Needles Syndrome is a rare inherited disorder characterized by skeletal dysplasia, typical facial appearances, and a large cranium. 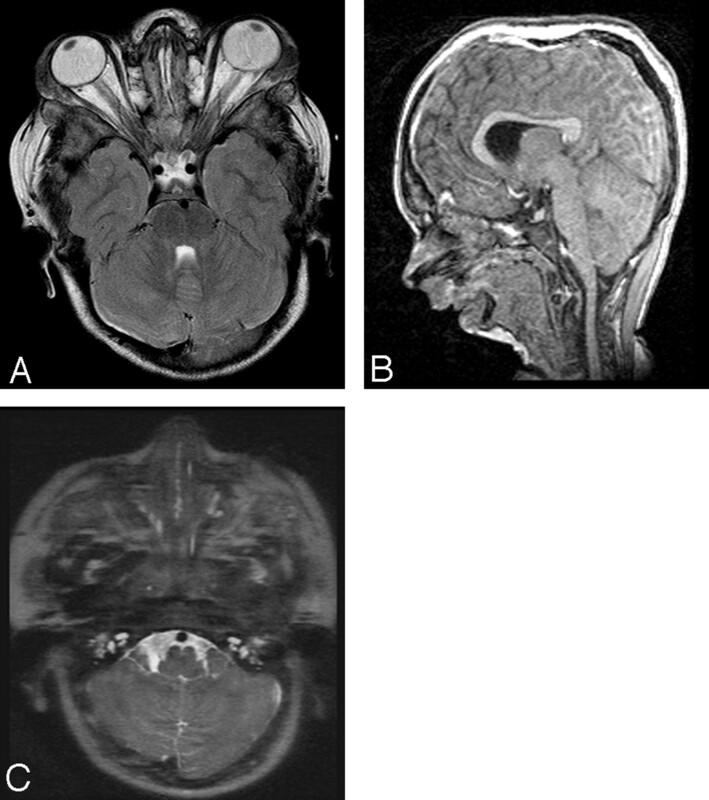 In this report of a female child with Melnick-Needles Syndrome, CT and MR imaging revealed bilateral cochlear hypoplasia. An infant with an unknown syndrome was screened by objective hearing tests as part of a routine protocol at 6 months of age. Auditory brain stem response was performed, which revealed a sensorineural hearing loss. At 1 year of age, the patient was retested by behavioral audiometry, including distraction testing, and the hearing loss was confirmed. The child's hearing was amplified by using hearing aids from an early age, and her auditory development progressed, though the child displayed general developmental delay. On review at 2 years of age, otoscopic examination and middle ear pressure/compliance measurements (tympanometry) revealed otitis media with effusion and scarring of the tympanic membranes. Hearing tests confirmed that hearing had indeed deteriorated further. On additional review, the right external auditory canal was noted to be narrower due to the presence of an external auditory canal wall osteoma. The patient had no speech because she had a permanent tracheostomy, but there was noticeable change of the child's awareness of speech, environmental sound, nonverbal communication, and social interaction. Adjustment of amplification of the hearing aid seemed to overcome the impairment. When the patient was reassessed at 5 years of age, her hearing had deteriorated further to levels of severe, bordering on profound, hearing loss. Audiometry showed increasing hearing loss, mostly at low frequencies, and to a lesser degree at high frequencies. The right tympanogram was flat, and otoscopy demonstrated extensive tympanosclerosis (scarring) on the right with bilateral middle ear effusions. At this stage, diagnosis of Melnick-Needles Syndrome was made. In view of the diagnosis and the progression of the hearing loss, CT and MR imaging of the temporal bones were performed to look for any underlying structural anomalies. 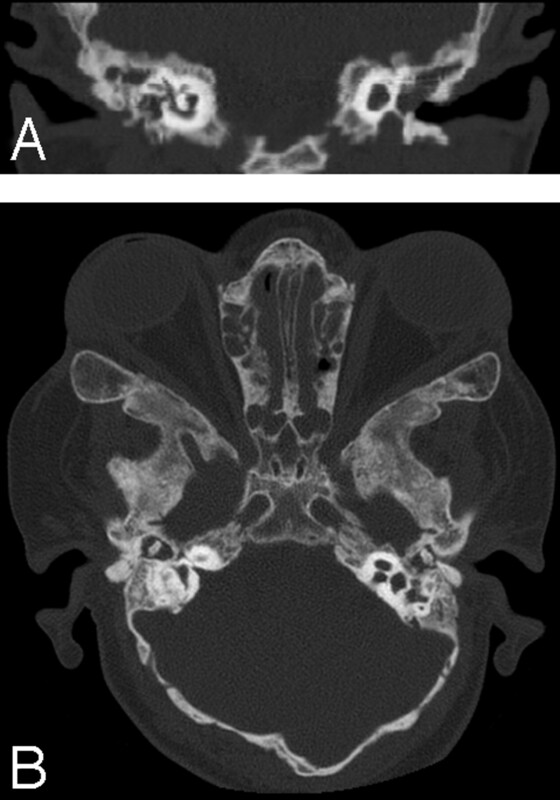 CT showed typical calvarial changes of Melnick-Needles Syndrome, as well as fluid filling of the middle ear cavities bilaterally, with an abnormal configuration of the bony ossicles. There was also bilateral hypoplasia of the cochlea, with no evidence of the modiolus, and a large solitary cochlear sac (Fig 1). The internal auditory canal was seen to be of normal width, and the course of the facial nerve canal was found to have an obtuse angle with the anterior genu (Fig 2). The vestibular aqueducts were not enlarged. These findings were confirmed on MR imaging (Fig 3). Hypoplasia of the cochlea has not been previously described in association with the Melnick-Needles Syndrome. A, Axial CT image demonstrates bone dysplasia, typical in Melnick-Needles Syndrome. B, Axial CT image through the cochlea demonstrates fluid in the middle ear and lack of a basal turn with no modiolus, consistent with hypoplasia of the cochlea. Prominent eyes can be seen. A, Coronal CT reformatted image through the cochlea demonstrates lack of modiolus and a basal turn of the cochlea. B, Axial CT image demonstrates normal vestibular aqueduct and widened angle of the facial nerve at the geniculate ganglion. A, Axial T2-weighted MR image shows prominent bulging eyes, as described in Melnick-Needles syndrome. B, Sagittal TI-weighted localizer demonstrates pronounced micrognathia. C, Axial T2-weighted image demonstrates hypoplasia of the cochlea. The bony labyrinth of the inner ear comprises the vestibule, the cochlea, and the semicircular canals.6 Axial CT imaging of the cochlea normally demonstrates the central bony modiolus with a notch on the lateral border. Coronal imaging of the normal cochlea demonstrates 2 and a half turns. All of these normal features were absent in the presented patient. The deafness associated with hypoplasia of the cochlea is usually sensorineural, with some preservation of high-frequency hearing. There may be associated vertigo, rhinorrhea, and recurrent meningitis. It is severe and permanent but can be difficult to assess even after a diagnosis has been made, especially in a young child.7 The case presented is unusual because the deafness was progressive. It is possible that Melnick-Needles Syndrome has progressive sclerotic skull base changes. Deafness has been described in Melnick-Needles Syndrome but is thought to be exceptionally rare.8 No association has been previously reported between Melnick-Needles Syndrome and hypoplasia of the cochlea. Melnick-Needles Syndrome is a rare disease with multiple manifestations. The high-resolution CT and MR imaging findings of cochlear hypoplasia may represent a further association of the Melnick-Needles Syndrome. The case illustrates the need for early scanning of temporal bones in children with head and neck syndromes who have confirmed hearing loss. Accepted after revision November 8, 2006.